Fantasy Spin: How will Semin respond to benching? Alexander Semin is expected to be back in the Washington lineup Wednesday as the Capitals host the Winnipeg Jets. Semin was a surprise healthy scratch Monday in the Caps win over the Coyotes. Both Capitals coach Bruce Boudreau and Semin owners will be eager to see how the enormously talented but notoriously inconsistent winger responds to the benching. In his latest aggressive coaching tactic, Boudreau decided to sit Semin in an attempt to send a message to his underperforming Russian star. Semin possesses the type of scoring touch about which most NHL players only dream. 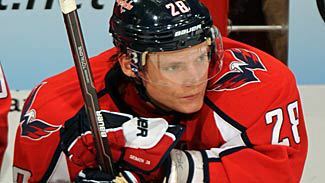 He has had one 40 and two 30-plus goal seasons in Washington, but his explosive skill is often subdued by frequent injuries and a mercurial scoring touch. So far, Semin looks in need of a Boudreau wake-up call more than ever. On top of instances of undisciplined play, Semin's production has been middling at best with nearly a quarter of the season gone. In 18 games this year, Semin is averaging only 2.3 shots per game for a total of four goals. He still has not cracked the double-digit mark in points, with only nine so far. That is a far cry from what many fantasy GMs expected from a 27-year-old entering what should be the prime of his career. Which Semin takes the ice Wednesday against Winnipeg is anybody's guess. He will likely need a few big-effort games to prove to Boudreau that he is deserving of playing the minutes necessary to be a fantasy force. If Semin does put a hot streak together off his benching, it could be a great incentive to try and sell high on him. While it’s probably unrealistic to think that one healthy scratch will be enough to correct years of maddeningly inconsistent play from Semin, if you strike when the iron is hottest you should be able to offload Semin in exchange for good value. By marketing him to your league as the attacking force he can sometimes be, you will be able to discard him well before his next cold spell inevitably arrives.